Each player takes on an inventor persona with unique starting components or special abilities accessible only to themselves. But the heart of the game is in assembling modular component tiles into a device for other players to use. 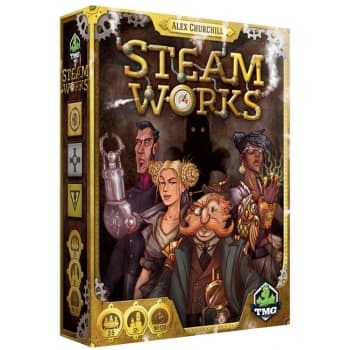 Sources may provide one or more of the three power types - clockwork, steam, or Tesla-style electrickal power - to the components connected to them, which in turn provide a wide range of effects for gaining resources, prestige points, or more component tiles. Devices start simple with just two components (one source and one component), but devices with three, four or more components will become possible - as soon as the players assemble a device to let it be possible. Because of the modular mix-and-match nature of the components, the available action spaces vary widely from one game to the next, providing great replayability: each game players will create devices never seen before!